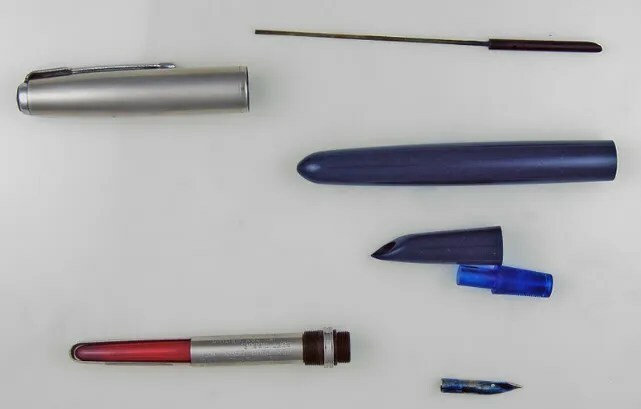 Fountain Pen Restoration Article Number 100! It is hard to believe that this is the 100th post here since November of 2007. I hope that the readers have found a few that they have enjoyed. Thank you for your comments, suggestions, corrections, and additions to many of these. Hopefully the next 100 will be worth the read. On to this week’s fountain pen. As you can see, the pen needs a new j bar (large size) and sac (size 20), as well a general cleaning. 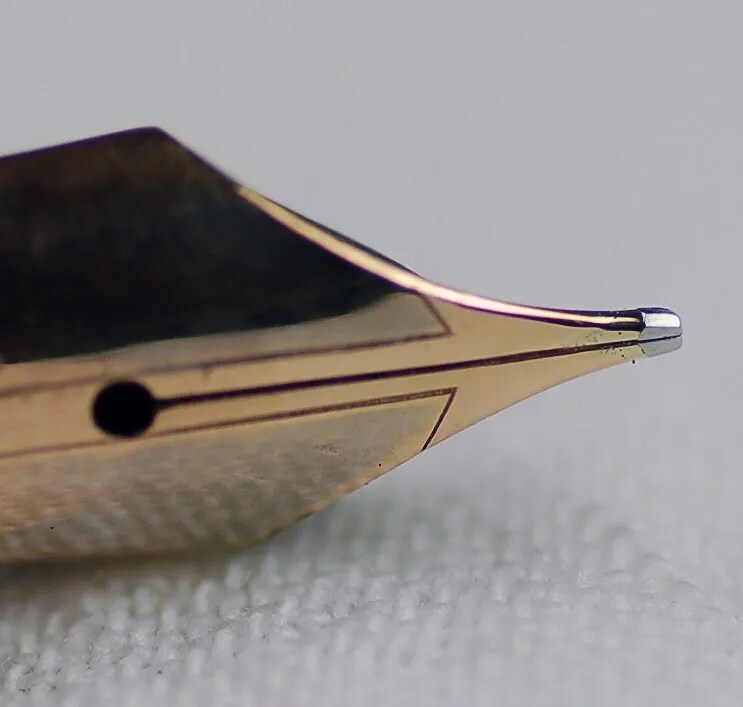 Below is a photo of the nib, a Warranted 14K No. 5. 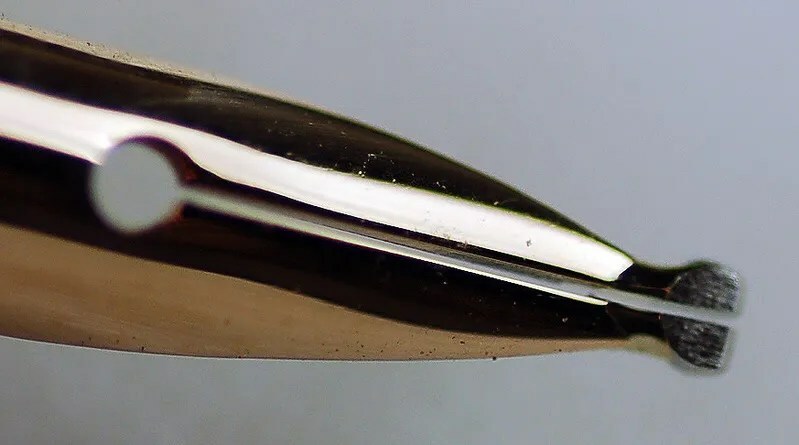 The main problem with the nib is that it is very bent, and the tipping material is gone from the left tine. This is work that is beyond my scope and as this is a unique nib, I decided to go ahead and get it re-tipped in lieu of replacing it with a spare regular nib. You may recall that I have done this with another pen, a Parker Vacumatic in an article from October 13, 2008 ~ 1942 Parker Vacumatic Maxima. Greg Minuskin does exceptional work, and his turnaround times, and communication, are outstanding. Below is a photo of the newly re-tipped Music Nib, which I received back in one week’s time. The photo is complements of Greg Minuskin. Music Nibs, so named as they are very useful in forming the characters necessary to compose music on music sheets, are available on a a few current pens. However, they were rarely offered on vintage pens and this is the the first vintage music nib that I have run across. Duocraft pens are often found with these nibs and it makes me wonder if they were aiming this product at the music community. The design of the nib allows for fine horizontal lines and wide verticals and well as a very flexible flow. I cleaned the old sac off of the section – cleaned the section and feed and inserted the retipped nib and feed back into the section. I reinserted a large jbar back into the barrel, checking for a firm fit. The barrel and cap, including the gold furniture were thoroughly cleaned and polished. Remember to take the time to clean the inside of the cap, as years of dried ink is usually lurking there. As I mentioned earlier, a size 20 sac was used and attached to the section/nib/feed unit before fitting back into the barrel. Below is are two photos of the completed restoration. The pen measures a large 5 9/16 inches capped and 6 1/2 inches posted. The imprint is still crisp and did not need to be highlighted with white to be seen. As you can see, Duocraft was in Brooklyn, NY. My talents are not in calligraphy, but here is a quick writing sample showing the line variation that this nib permits. These pens do pop up from time to time and at reasonable prices. Should the nib be in good shape, they are an excellent way to show off your writing flair, and maybe compose a symphony or two! I seem to have done several Parker Vacumatic Pen repairs recently. All have been different in their own way. First I did a Speedline Filler and then a Lockdown Filler. This restoration is also a speedline filler from 1942, but has two unique characteristics. First, it is a larger size Maxima (though a single jewel), and it came with a badly damaged nib. As you can see from the first picture below, the pen came in quite dirty condition with a badly damaged nib with no tipping material. The nib has the same 1942 code as the imprint, so I am thinking it is the original nib. However, it sat too far out of the section (as did the feed) and this caused the damage as the cap was screwed onto the barrel. The positive of this is that the pen was in such negative condition that it came at a very cheap price. Here is a picture of the nib after I knocked it out of the section. As you can see it still has its two-tone finish but is severely bent inwards. I do not have the tools or expertise to re tip nibs, so I sent this out to Greg Minuskin, who I also mention in the post entitled Parker 51 Nib Change. I requested that he repair the damage done to the nib, and restore to a fine stub. The repaired nib, as received in one week’s time, is below. As you can see from the top photo, this is a Vacumatic Speedline Filler. As it is the Maxima size, it required a standard sized diaphragm, as opposed to the debutante size, used in most Vacumatic repairs. The breather tube and all other parts were salvageable, though they needed cleaning. As with most Vacumatic repairs, take extra time to make sure the barrel and cap are cleaned out completely. I use many q-tips to clean after making sure the old diaphragm material is completely removed. Be careful not to scrape the inside of the barrel as this will compromise the barrel transparency. After removing the old pellet from the filler, I trimmed the diaphragm and proceeded to work the sac back over the filler after the new pellet was inserted in the filler. The filler was then screwed back into the barrel with the vac tool (see previous posts) and tested to make sure it was seated properly in the barrel and had not twisted. Once this was done and tested for suction, I polished up all of the parts, including the clip, jewel, band and barrel/cap. I then inserted the nib and feed into the section and inserted the breather tube into the feed hole. Make sure that the breather tube is completely cleaned and clear of obstructions. This can be done with an ultrasonic cleaner and fine wire. This unit is then screwed back into the barrel and tested with water to make sure the vacumatic filling system works. The finished product is below – s 1942 Single Jewel Golden Pearl Vacumatic Maxima with a fine stub nib. I am currently using it, filled with Waterman Florida Blue Ink, and enjoying the feel and creativity of the fine stub nib. The Parker 51 is a highly collected pen, revered by pen enthusiasts around the world. First introduced formally in 1941, it continued in production into the 1970s. Over the years it had different filling systems (Vacumatic and Aerometric), was produced in many different countries (USA, Canada, Great Britain, Argentina..), and in varying sizes, colors and styles. The history is rich and for further research there is a very comprehensive book titled Parker 51, by David and Mark Shepherd. I have several Parker 51s and have always enjoyed them. 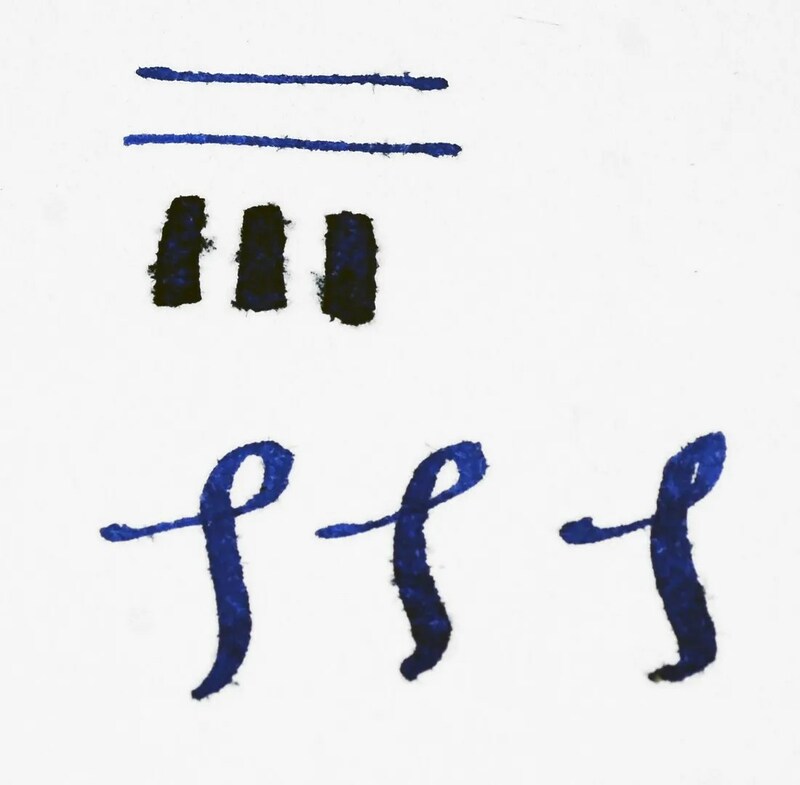 My only complaint, if I ever had one, was that most of the nibs were very similar – fine or medium. These pens did come with other nibs, but they are uncommon on pens that one finds in the wild. I finally took the plunge and purchased a broad stub nib for a Parker 51, produced by Greg Minuskin. His website can be found here and he specializes in re tipping fountain pen nibs. I had read about his work and seen an example on one occasion. 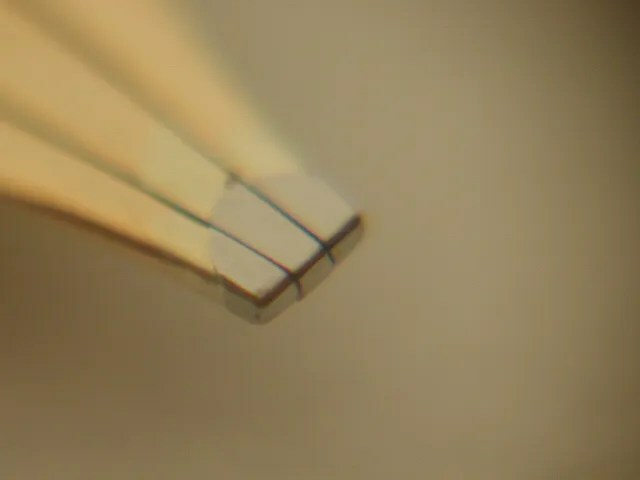 I thought it would be a good opportunity to take some pictures of a 51 / Aerometric opened up as I changed out the old fine nib for my newly purchased broad stub. Below, you can see the components. The sac assembly was working well, so I did not take it apart. As you can see, there is a lustraloy cap, blue barrel, matching blue hood, badly stained collector, nib, feed and attached breather tube. I took the opportunity to clean the collector, feed, breather tube, and old nib (which I can use on another pen). The hood unscrews from the aero assembly. If it is difficult to unseat, gentle heat is a good solution. Be certain to unscrew as it is not a friction fit. The breather tube can be cleaned with a fine wire, if it is clogged. The collector and feed are easily cleaned in and ultrasonic cleaner. Here is a picture of the new nib – a juicy broad stub. It simply fits over the old feed and the breather tube attaches back to the feed in the hole at the end of the feed. The feed is reattached into the collector which is reinserted into the sac assembly. Here it can get a bit tricky. 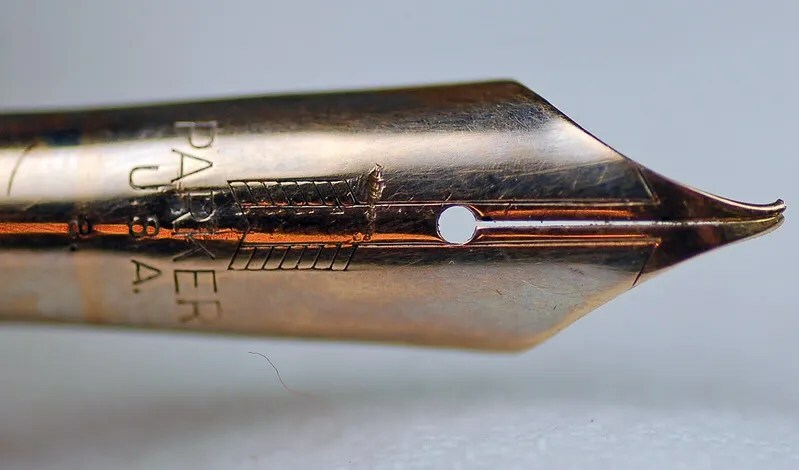 When the hood is screwed back on to the pen, it may not align perfectly with the nib. You may have to pull the feed and nib out of the collector to move the alignment to the hood. 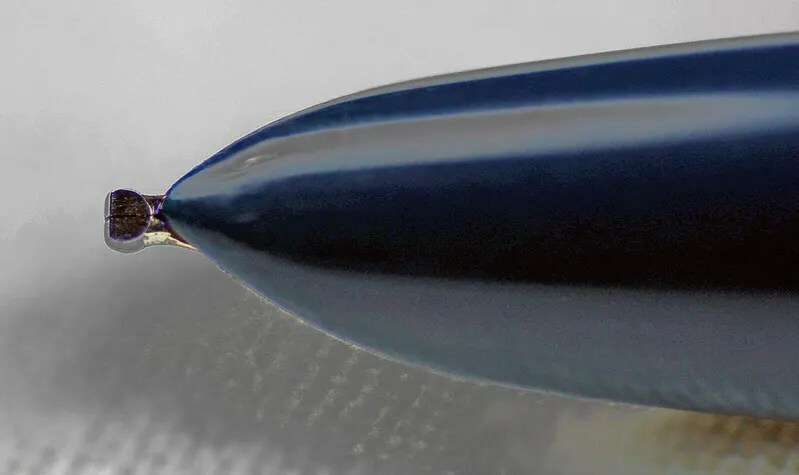 Here is a picture of the nib after it has been fully set in the pen. The broad stub lines are a treat to use.